The work on LHC physics at Caltech focuses on a wide range of lepton, photon, jet and missing ET signatures. The Caltech group has focused on the search for the Higgs in the bosonic channels, with a long tradition of searching in the diphoton channel and, more recently, the WW and ZZ channels. The group also focuses on the search for SUSY and, more generally, for dark matter particle candidates using its game-changing new set of "razor" analysis methods (developed with colleagues from LPC/Fermilab and CERN). The group has been central in ECAL monitoring and calibration for over 15 years and, more recently, in the HCAL and trigger groups. The group has had central roles in the study of neutrino and antineutrino oscillations as well as the measurement of theta-13 in MINOS and in construction, trigger, readout, reconstruction and analysis for NOvA. The flavor physics analysis efforts at BaBar have recently set new limits on dark-sector particles, and the work on SuperB and Mu2e has focused on rare heavy-quark and charged-lepton decays. The theory group effort covers string theory, field theory, beyond-the-Standard Model weak-scale physics, early-universe cosmology, Standard Model physics and LHC phenomenology. Barry Barish, a professor at Caltech, leads the ILC Global Design Effort. WHAT SETS PARTICLE PHYSICS AT CALTECH APART? Caltech has a long history of collaboration with Fermilab, starting with work on deep inelastic scattering and neutrino physics in the lab's early days and continuing with the Tevatron and work on MINOS, NOvA, CMS and Mu2e today. 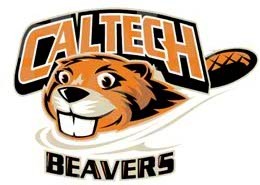 Caltech is small, with a low student-to-faculty ratio and a special focus on term-time and summer research for undergraduates as well as grad students. This continues to attract outstanding students in experiment and theory, many of whom have worked at CERN in recent years. 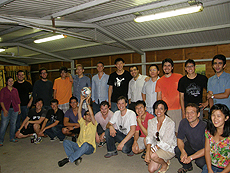 Members of Caltech's particle physics group. 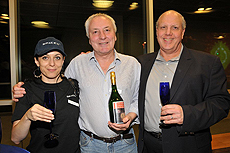 Caltech professors Maria Spiropulu and Harvey Newman of the Caltech CMS group, together with Lyn Evans (center), founding leader of the LHC Project.